Thought it was about time I posted some progress pictures of some of the 1:2500 Trek kits I’ve been working on. I was given a number of models by a very good friend recently and been working on these to complete the decaling (he didn’t like this bit very much) and building up a nice Fleet. So this is the current state of play. Bottom row is Oberth and Cordia. Middle row is a kitbash which has the Reliant rollbar slung underneath, Constitution and Jenghiz. Top row is Belknap which was given to me built and I’ve decaled, light cruiser (can’t remember the name of this one at the moment but will check later) which I need to finish the decals for and Abbe. There is the Excelsior class I’m currently decaling on the left of them all, still working on the nacelles. 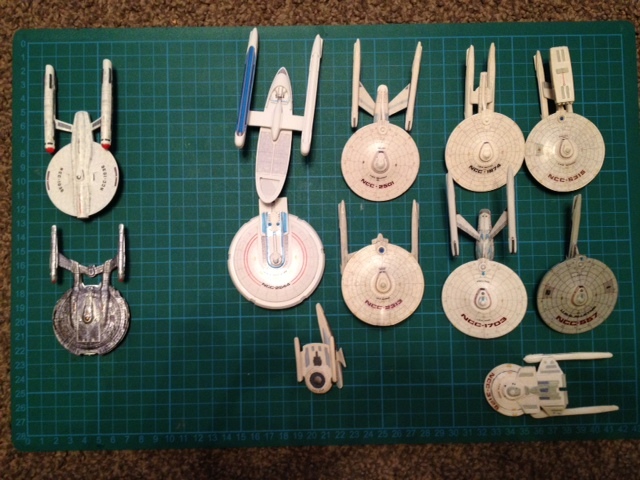 And far left we have the NX-02 Columbia and the Bonaventure class, which a pre-original series era ships. Most need some bits a pieces finishing off and I need to run some replacement decals for them, but coming together! Got another couple of Oberth’s to go in (a regular one and I think it’s a Jester class), a Lantree style Miranda class (no rollbar) and a regular Miranda. Got one or two ideas for some kitbashes as well but these would be based around the regular Enterprise hulls. But need to think about some smaller ships to go along with these. Not much out there though. Will get some better pictures shortly once they are mounted properly.